to the nesting boxes and collected two lovely white eggs, gifts from Lady Mary and Edith. so I was delighted to know that I would have a couple for Saturday's breakfast. and 15 minutes later, there was still no sign of Mrs. Hughes. Where could she be? Sure enough, there was Mrs. Hughes in the far corner, and there were two white eggs nearby. I opened the lid to the pig palace to get a better look. Was Mrs. Hughes sick or was she just being broody? Johnny wanted to find out what was going on as much as I did. ...and got quite a surprise. 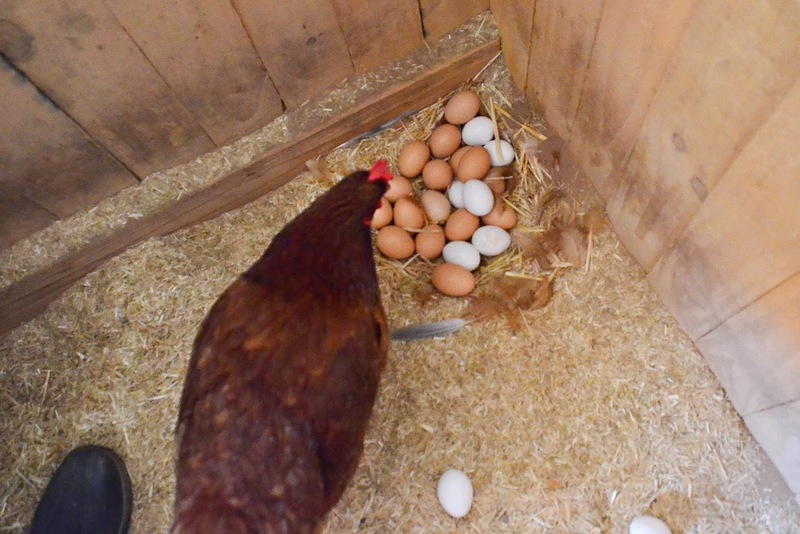 Me: Don't count your chickens before they hatch, Mrs. Hughes. You're not keeping any of them! I collected 26 eggs and boarded up the pig palace. 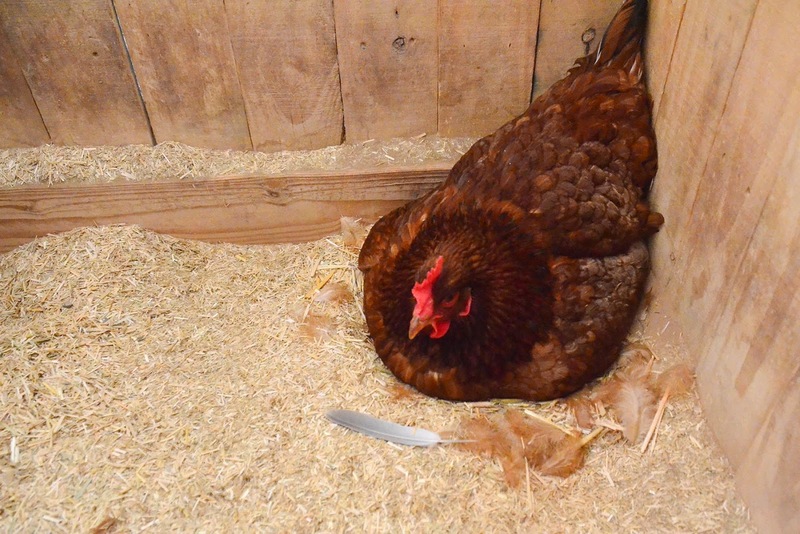 The girls have three perfectly fine nesting boxes in their coop – they didn't need a secret stash. I guessed that the girls had been pulling the feathers over my eyes for about two and half weeks. 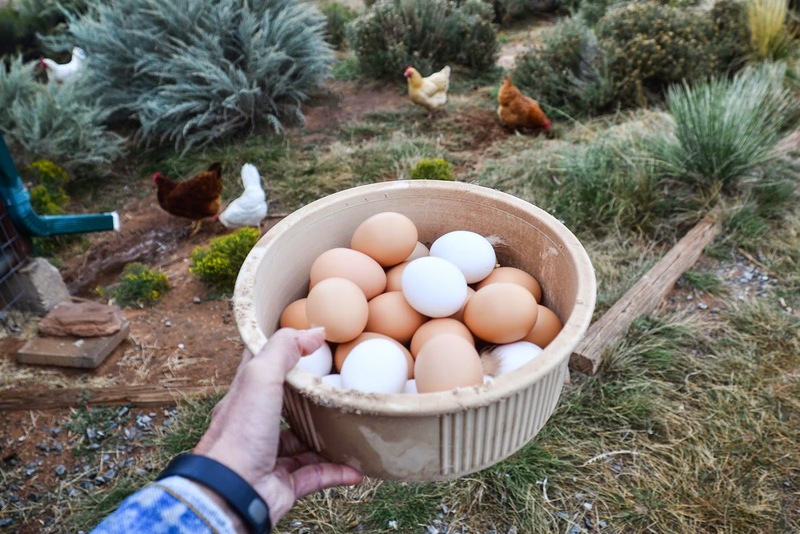 Were these 26 eggs safe to eat? I turned to my favorite chicken whisperer, Danni, for advice. 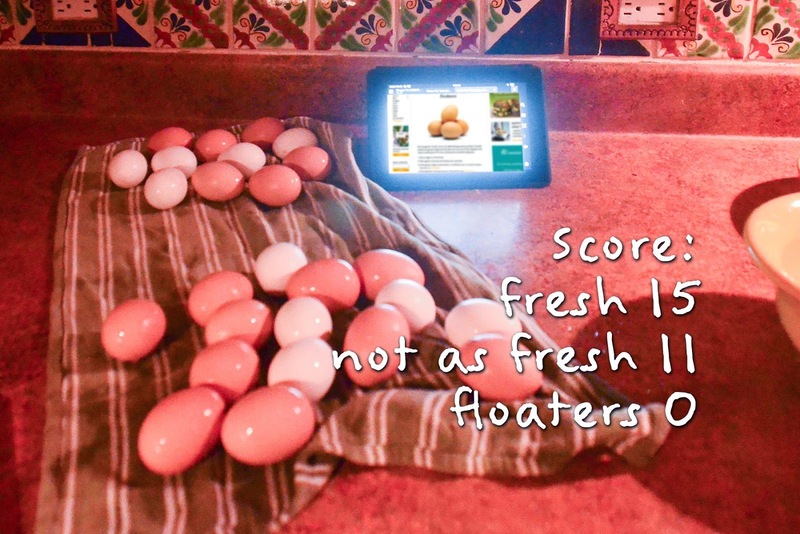 She pointed me to this test for checking eggs for freshness. Danni had never tried it but had read about it often enough to believe it had merit. 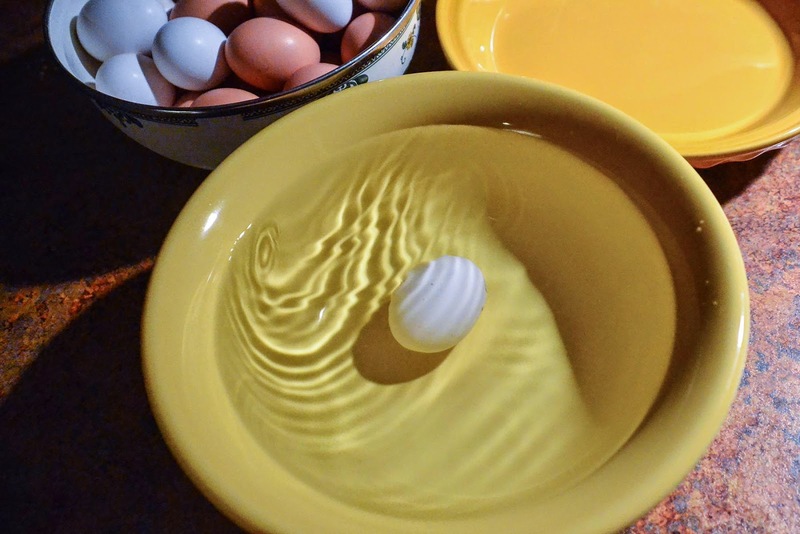 You place the questionable egg in a bowl of water. If it stays on its side at the bottom of the bowl, it's fresh and safe to eat. 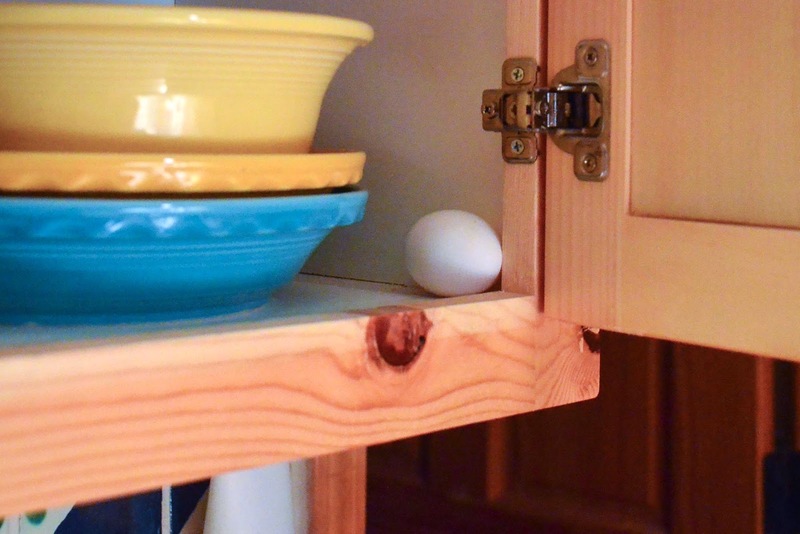 If it stands upright at the bottom, it's still safe but should be eaten soon or hard boiled. If it floats, throw it away. the older the egg, the more air it has absorbed and the more it will float. and even more so by the fact that something on the internet proved to be true. I stashed one of the eggs in the cupboard and will retest it in a few weeks. You will remind me, right? A woman who loses track of 26 eggs is not to be trusted. Meanwhile, I'll be having egg salad sandwiches for lunch every day this week. Ahhh, that Mrs. Hughes! Maybe you can buy some fertilized eggs sometime, so she will have a chance to develop her maternal urges? I love it when you make me laugh like that first thing in the morning! Perhaps the Palace is more spacious for the Ladies. They do like a grand habitation! It looks like you'll have enough for guests! Be right over. What A Haul! Sneaky chickens for sure. Just because you found this stash doesn't mean they won't start another one. Perhaps they are too lazy to use the approved nest boxes without an incentive. 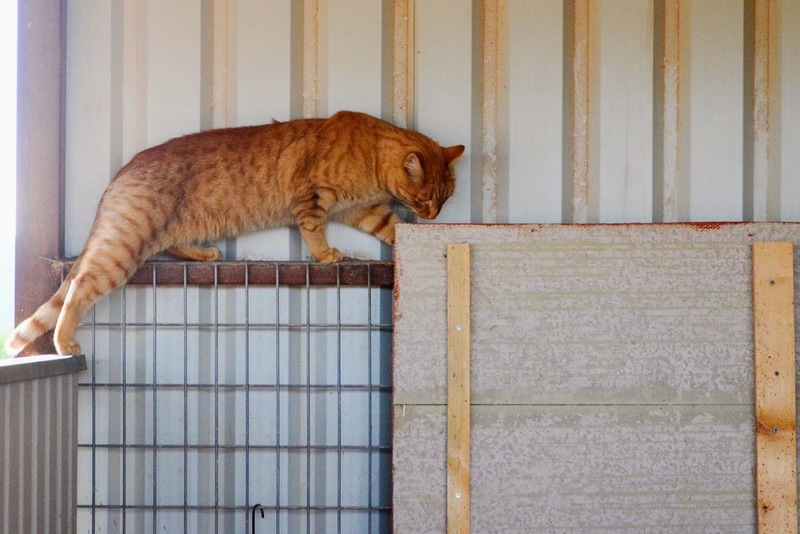 If you hide/place a little treat at the front of the boxes, perhaps they can be trained to 'check' the nest boxes and get over the fact that their eggs vanish each day. Or provide them with a 'lazy chicken' nest box ? Something easy to access with more privacy. Wynonna's hidey-hole seems to have met with approval on that count. Apparently Johnny has been doing his job. Wynonna's Pig Palace didn't get raided by any egg-eating varmints. That Mrs. Hughes is a canny chicken! That's so funny. Looks like all the ladies were using that secret spot. That's on lumpy bed. Yes, Danni's test is a tried-and-true one. Chefs know it, too! Glad you were able to keep them all--that's a better result than I would have hoped for. Supremely sneaky chickens. Glad you found the stash. Aww. It makes me feel a little sad to think that the girls want to have their babies. 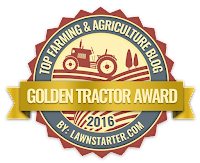 No chance of a rooster visiting for a day, huh? I want to know how your hard-cooked eggs taste, too. I have three hens and am finding chickens really do have quite the personality!!! I love them dearly! I was shocked when I saw the picture of all the eggs. Quite funny actually. I have been on the lookout for the secret stash at my house as well. I know there must be one, as 4 of my hens are expert flyers/escape artists and spend their entire day freeranging despite my best efforts to keep them in. I had tricked them into laying where I wanted by putting nesting boxes here and there on the property. They decided that wasn't what they wanted to do after about 2 weeks. I'm certain I have a nest with many, many eggs somewhere nearby. I just can't find it. Can you 'bug' a chicken and track it like you can a child? 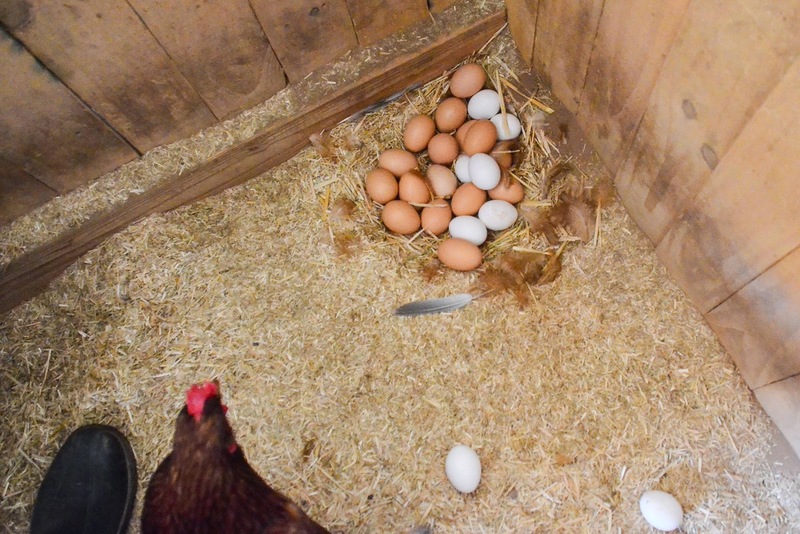 Can Mrs. Hughes lay brown and white eggs? I'm not sure how just one person can get through that many eggs! I go through about a dozen a week, 2 go to the dogs, and I have breakfasts/lunches w/ the rest. Even then, I'm getting tired of them. And then it starts all over again.....I get my eggs from a co-worker with chickens and they truly are delicious. I love knowing they came from happy chickens, too! Maybe she is uncomfortable laying in front of others? Or her middle name should be Greta Garbo? Possessive little birds, aren't they! LOL! Oh, Yes. Bad eggs float. By the time they get to floating stage they are within exploding stage. Hope you don't forget your science experiment. If you do--everyone there will regret it. Oh wow! They found a great little corner to hide their eggs in! A treasure for you! Thanks for that GREAT laugh when you lifted Mrs. Hughes and revealed her egg farm!! The picture taken from above that showed only 2 white orphan eggs...and then the Big Reveal!! 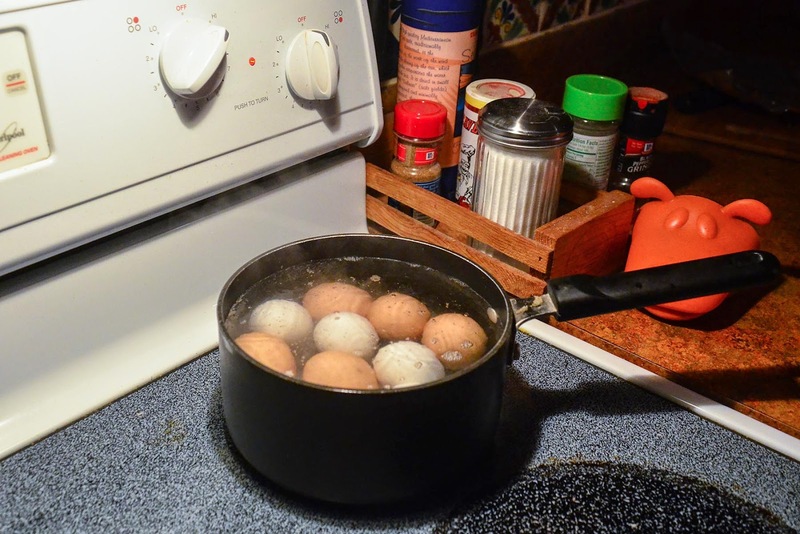 And in that last photo of the boiling eggs, take a look at that egg on the far right...2 eyes and a mouth grimacing with teeth..."I'm gonna tell my mom about this and then you'll find out about her notorious biting beak!" Funny, but it looks a little like angry Stewie from Family Guy, don't ya think?! 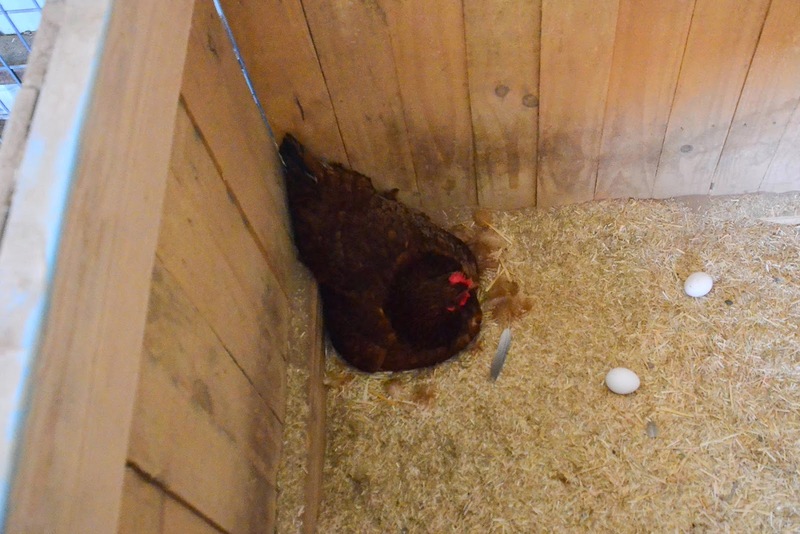 I gasped at seeing Mrs Hughes' questionable place to lay eggs, werent they mostly her eggs? Poor thing. I had a couple of chickens lay eggs in the darnest places. It was like an Easter egg hunt on many occasions. I sure wish I knew that trick when I had my 6 chicks. why not letting them lay in the pig palace pen if that is comfy for the girls?